Day 1: Arrive into either Dublin Airport. Enjoy chauffeur driven private transfers to the 4-star hotel. Evening will be at your leisure to relax and unwind. Day 2: Today you and your group will golf the Portmarnock Links course. Located just 10 miles from Dublin City, this dune-lined course is located right on the coast of the Irish Seas with spectacular views from every hole. Day 3: Heading today to Drogheda, you will play the County Louth Golf Club, established in 1892. This course was rated by Golf Digest as one of the top 100 courses in the world. Day 4: Today will be your second tee time at Portmarnock, this time you will play on the Championship Course. 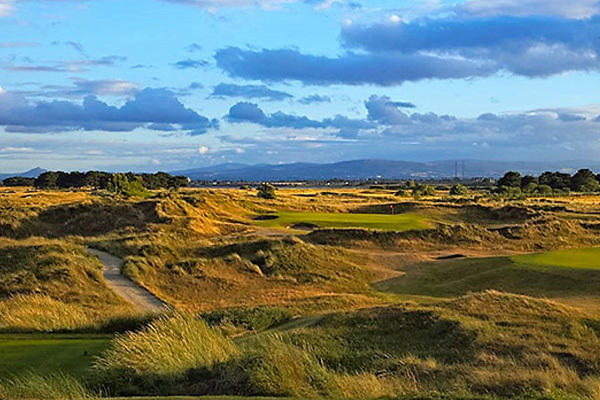 This course has been host to multiple Irish Open Championships and is considered to be the finest and most challenging links courses in all of Ireland. Day 5: Today you head to The Island Golf Course, founded in 1890. This links course features Championship Links and stunning dune views on the east coast of Ireland. Day 6: Your tee time today will be at the Royal Dublin, Ireland's second oldest golf club. Located on Dublin's Bull Island in Dublin Bay, the course is one of the largest golf club in the county. Enjoy this very traditional links course filled with history and exceptional greens. Day 7: Your final tee time will be at the European Club. Located 30 miles south of Dublin, this finale to your Irish Golf Experience will be one that you will never forget. This course features dunes and sea views from nearly every hole and 5 holes that run right along the beach!